Big Oil, Solar, or Wind for the Next Decade? If you're investing in energy you'll want to bet on the trends that are winning long-term. A solar farm being built in the desert. Image: SunPower. There are a growing number of new competitive energy sources today, something that seemed nearly impossible only a decade ago when coal, natural gas, and oil dominated energy. Most people still fill their cars with gasoline and heat their homes with natural gas, but electric vehicles are growing in popularity and renewable energy now accounts for over half of the new electricity generation built in the U.S. every year. For investors, which energy source is worth focusing most of your attention on? The answer might surprise you. Oil is the most commonly known energy source we buy today, but it's not much of a growing energy source, especially in developed countries. The U.S. and Europe are seeing long-term declines in usage and that's putting more pressure than you might expect on big oil profits. You can see below that earnings per share are down at ExxonMobil (NYSE:XOM), BP (NYSE:BP), and Royal Dutch Shell (NYSE:RDS-A) over the past decade and unless we see a surge in oil and gas prices I think that will continue. Declining investment in new oil projects and falling returns from existing ones are problematic as well. 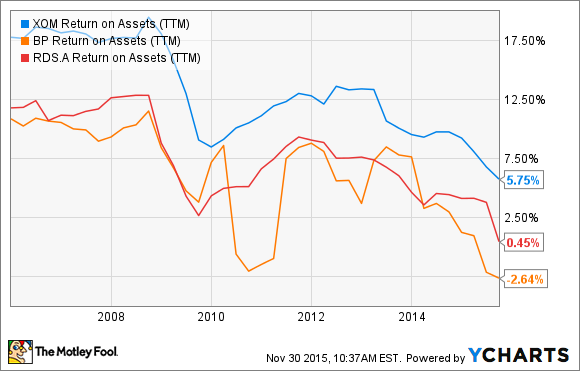 You can see below that return on assets invested was declining even before oil prices began to fall in mid-2014. That's not a good sign for the industry. This isn't to say that oil is dead as an energy source. It's still highly important to the economy. But for investors, I think big oil's best case scenario is big oil maintaining profits and there are energy sources that will be able to grow profits significantly in coming decades. Which renewable energy is better? Wind and solar energy are both clean and provide cost effective energy. But they differ in long-term potential and cost trajectory, which will affect their adoption rates. On the potential side, if we could capture all solar energy that hits earth for only an hour a year we could replace all sources of energy. No other energy source has that potential. Recent studies have suggested that wind could power the planet if deployed on a wide scale, but the potential is nowhere near as high as solar. On the cost side, solar energy is also reducing costs faster than wind and is now less costly than wind in some parts of the U.S. There's no indication that this trend will stop as solar manufacturers push down costs and installers become more efficient. 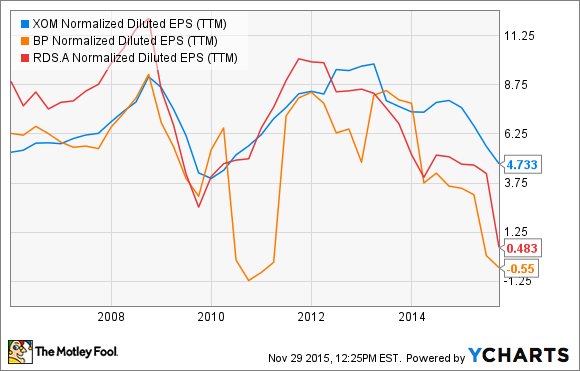 Data from Lazard Levelized Cost of Energy Analysis. Chart by author. Solar energy is also the most flexible form of energy generation. You can put it on your roof, in a field, and even in small electrical devices. This democratizes energy and creates a new competitive environment in energy. While solar energy may have the best potential of big oil, wind, or solar over the next decade, that doesn't mean it's a slam dunk investment. There's still a lot of flux in the industry and companies rise and fall quickly. Two companies to watch are First Solar (NASDAQ:FSLR) and SunPower (NASDAQ:SPWR), which have both survived many market disruptions over the past decade and remain profitable. They have diverse, international end markets that make it possible to survive ups and downs that happen on a country-by-country basis. As the industry has matured, First Solar and SunPower have begun consolidating power and added capability, with improving efficiency, energy storage, and new financing options from a joint yieldco. Long-term, I think they're the two to with the best chance to disrupt energy and grow profitably for decades to come, even if the ride continues to be bumpy along the way.